Kwanzaa is celebrated far and wide, by all politically correct cartoon characters on the disney channel. A bucket full of miracles! I must say this is made me laugh irl. 5'd also description AND keywords. "And, lo, from the heavens, the Angel robed in white descended to bestow upon the good people his manna, the color of burning gold. And in each crispy morsel were the herbs and spices, they numbered eleven, and were only know to the Angel and Heaven. And, yea, it was good." I like how the whole family is like, "excuse me, wtf are you doing in here," but he busts in anyway. Colonel Sanders is one rude sonuvabitch. Negros enjoy eating Kentucky Fried Chicken. I GET IT, IT'S FUNNY BECAUSE NOBODY CELEBRATES KWANZAA. The Paleface brings us a tribute of fried chicken. I couldn't stop laughing, and it's pretty hard to make me legitimately seriously laugh outloud. The drawing was just done perfect, especially the Colonel, hahahahahah. Fav'd! 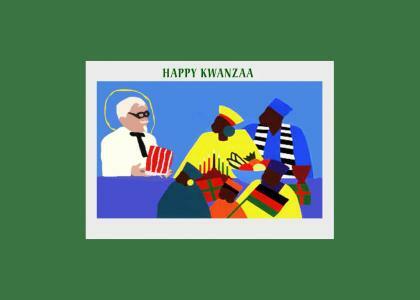 KFC = Kwanza's For Chicken. A Kwanzaa Miracle Once upon a time in the small country of Kenya, lived an old mean man by the name of Muhammad Benya. Now Muhammad Benya made all the KFC restraunts go grilled, and everyone felt as if they were killed. Now one day Colonel Sanders came in and made all the KFCs go fried, and Muhammad Benya fell over and died... of aids. THE END! 5th place is what you get when you use racial stereotypes. Congrats!